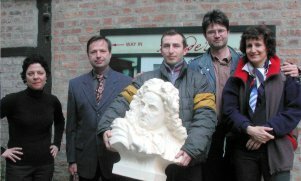 On 14 July 2001 the Czech Handel Society commissioned the sculptor Petr Novák (b. 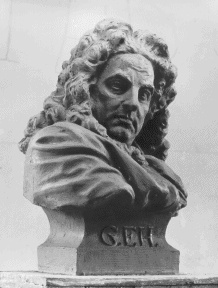 1957) from Jaroměř, East Bohemia in the Czech Republic, to make a plaster bust of George Frideric Handel. Petr Novák worked on the clay model in February and March 2002, the casts were made by the stonemason Josef Šraibr. 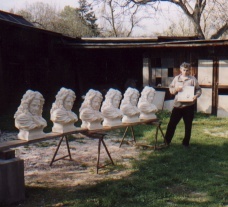 The bust was dispatched from Josef Šraibr's workshop at Jaroměř on 25 April 2002, totalling five originals and one replica. These objets d'art are toned plaster casts, 66.5 cm in height. The likeness of the composer was modelled on authentic plastic and pictorial items preserved from his lifetime. Original No. I/VII - Church Conservatory in Opava, Silesia, Czech Republic. Original No. II/VII - Händel-Haus, Halle an der Saale, Germany. Original No. III/VII - Pavel Polka, Prague, Czech Republic. Original No. IV/VII - Göttinger Händel-Gesellschaft, Göttingen, Germany. Original No. V/VII - Michal Typl, Mníšek pod Brdy, Central Bohemia, Czech Republic. Original No. VI/VII - Handel & Hendrix in London, Great Britain. Due to a continuing interest in the bust it was necessary to launch, in the spring of 2004, the production of bronze casts. Jaroměř, February 2002. 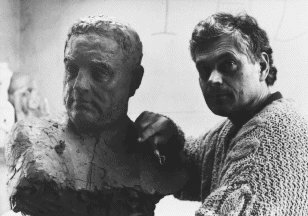 Petr Novák in his studio with the unfinished clay model for the plaster bust of G. F. Handel. Jaroměř, March 2002. The finished clay model for the plaster bust of G. F. Handel. Jaroměř, 25 April 2002. 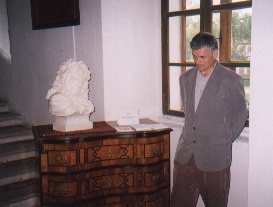 Petr Novák, author of the bust, with all the plaster casts in the yard of the stonemason Josef Šraibr. Jaroměř, 25 April 2002. 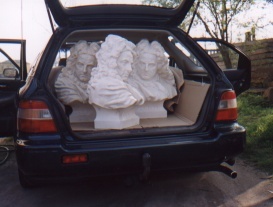 Plaster casts of the Handel bust in the loading space of the car of the Czech Handel Society. Prague, 29 April 2002. 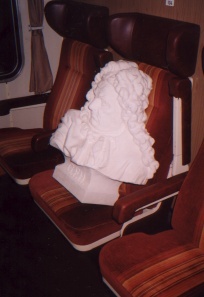 A plaster cast of the Handel bust in the compartment of an international express train, before departure for Cheb, West Bohemia. Prague, 16 May 2002. 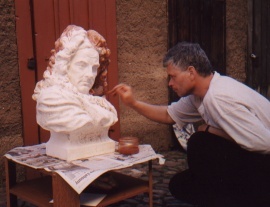 The sculptor Petr Novák applying a new colour to the Handel bust assigned to the house where the composer was born, in Halle an der Saale, Germany. Stately home Mnichovo Hradiště in Bohemia, 29 May 2002. 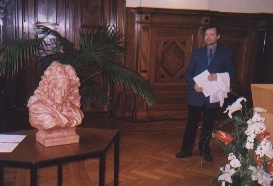 The sculptor Petr Novák during the public presentation ('unveiling') of the Handel bust. Halle an der Saale, Germany, 8 June 2002. 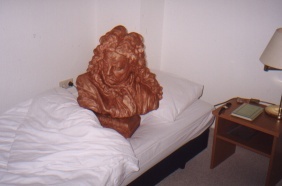 The Handel bust after the night in a suite at the hotel 'Am Wasserturm'. Stadthaus in Halle an der Saale, Germany, 8 June 2002. 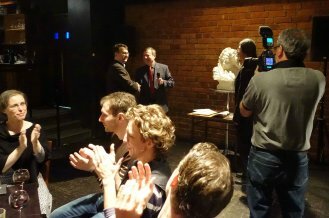 The ceremonial presentation ('unveiling') of the Handel bust at the members' meeting of the international George Frideric Handel Society. On this occasion the sculpture was officially presented to the house of the composer's birth. Halle an der Saale, Germany, 9 June 2002. 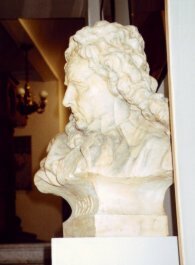 The Handel bust in the entrance hall of the house where the composer was born. Brtnice in Moravia, 29 June 2002. 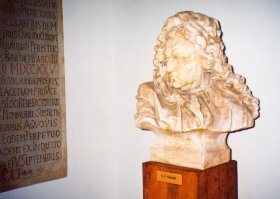 The Handel bust near the entrance in the Church of the Blessed Giuliana di Collalto. Library of the stately home Náměšť nad Oslavou in Moravia, 21 September 2002. The bust in the audience at the conclusion of a performance of Handel's 'Acis and Galatea'. Halle an der Saale, Germany, 7 June 2003. The definitive accommodation of the Handel bust in the undercroft of the house where the composer was born. 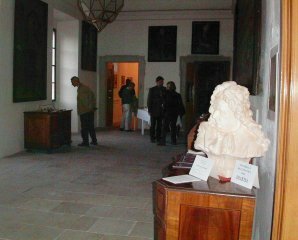 The Handel bust on display, for a longer time, in the corridor on the first floor at the stately home Mnichovo Hradiště in Bohemia. Photo from 5 September 2003. Handel House Museum, London, 30 March 2004. The Handel bust is being handed over to Jacqueline Riding, Director of the Museum. Handel House Museum, London, 30 March 2004. 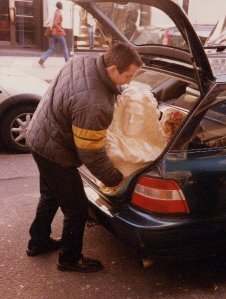 A picture taken shortly after the official handover of the Handel bust: members of the Czech Handel Society's delegation are evidently relieved that the plaster bust has endured the strenuous car journey from Prague to the London home of the composer. On the left, Jacqueline Riding, Director of the Handel House Museum. 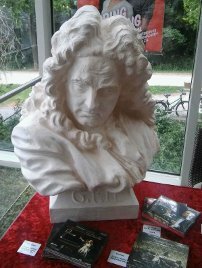 The author's plaster cast of the Handel bust exhibited at the gallery 'Galerie Alfa Omega' in Karlovy Vary (Carlsbad), Czech Republic. Photo from 23 September 2006. Halle an der Saale, Germany, 5 June 2007. 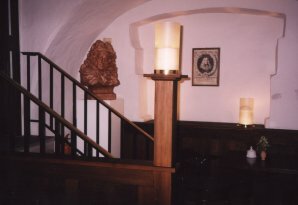 The new accommodation of the Handel bust in the undercroft of the house where the composer was born. Mladá Boleslav (Jungbunzlau) in Bohemia, 17 December 2011. 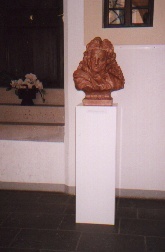 The author's plaster cast of the Handel bust exhibited in the Church of St Bonaventura (part of the Škoda Auto Educational Centre On the Carmel [Na Karmeli]). Venice, Italy, 6 November 2014. 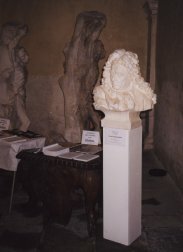 The author's plaster cast of the Handel bust exhibited in the Palazzo Ferro Fini, seat of the Regional Council of the Veneto. Sculpture exhibition 'Petr Novák from Jaroměř. With brothers of my soul: the tree, the horse and the rock at the moment of sacred presence'. 10 October - 10 December 2014. 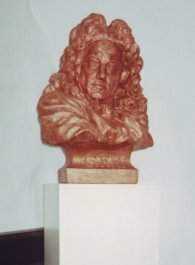 The author's plaster cast of the Handel bust in the catalogue of the sculpture exhibition 'Petr Novák from Jaroměř. With brothers of my soul: the tree, the horse and the rock at the moment of sacred presence'. Venice (Italy), Palazzo Ferro Fini. 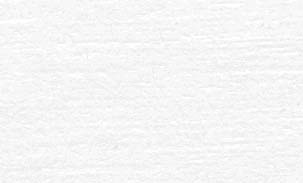 10 October - 10 December 2014. Page 45.
International Handel Festival in Göttingen. German Theatre, 16 May 2016. 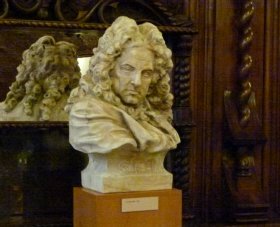 A picture taken at the festive presentation, by the Czech Handel Society, of the plaster cast of the Handel bust No. IV/VII to the Göttingen Handel Society after the last Festival performance of Handel's opera 'Imeneo'. All the performers and the whole production team were attending the event. 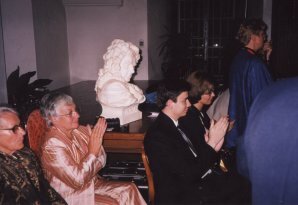 In the background at the bust, from the left: Tobias Wolff, Managing Director of the Festival; Pavel Polka, Chairman of the Czech Handel Society; Michal Typl, Technical Director of the Czech Handel Society. Photographed by Ezra Wolfhart Kurth, Göttingen. International Handel Festival in Göttingen. Window of the ‘TonKost’ music shop in Göttingen (Theaterstraße 22), 12 May 2018. 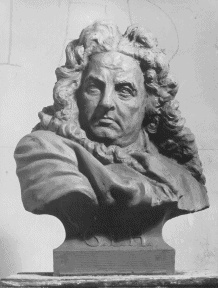 The plaster cast of the Handel bust No. 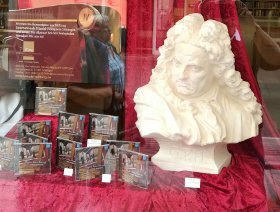 IV/VII, borrowed from its owner, the Göttingen Handel Society, dominates the window. Photographed by Stefan Lipski, the shop’s operator; Hardegsen. International Handel Festival in Göttingen. The German Theatre, Göttingen, on 12 May 2018. 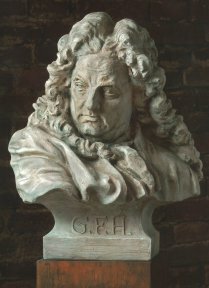 The plaster cast of the Handel bust No. IV/VII on the sales and information desk of the Göttingen Handel Society. Photographed by Michal Typl, Technical Director of the Czech Handel Society.